Not only are doctors and nurses lacking the supplies they need, the damage caused by the 5.9-magnitude tremor late Saturday made conditions even more challenging. “There was no electricity here, so we couldn’t receive the huge crowd that came last night,” said Paul Miclaude, a doctor working in the emergency room. 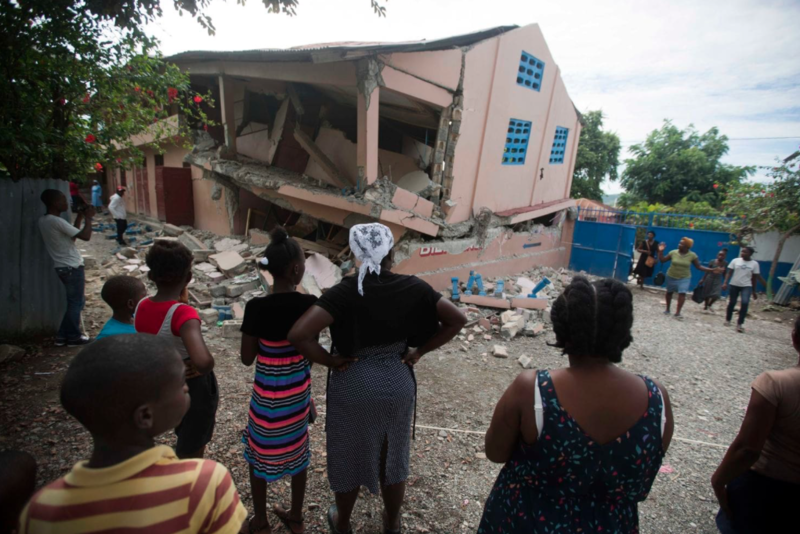 So far, the quake has claimed 12 lives, according to Haitian officials. Eight of the victims died in Port-de-Paix. Miclaude said that even on Sunday, doctors were without needed supplies. “Patients are out buying medications, gloves, you name it — they have to, despite their trauma and their destroyed homes,” he said. She had arrived several hours before — with the body of her 20-year-old son. “When everything started to shake, my child was about to leave the room. Then all of a sudden, he flew in the air and because the walls were falling down, he fell on a piece of rebar,” Donne recounted. “I’m going to go get the medicine,” Donne said, her voice barely audible. Just as police began to restore order at the entrance to the hospital, and several crates of medicine arrived from the health ministry, the glimmer of hope was quickly dashed by a 5.3-magnitude aftershock — and chaos reigned once again. Standing near mattresses on the ground in the yard, where patients received IV drips, the hospital’s medical chief Polycarpe Saaely says he hopes more help is on the way. “With all the aftershocks, we can’t really stay inside, so we are putting up tents to receive the various patients who arrive,” said Saaely. Indeed, the building was completely empty — the ceiling had caved in in several places. President Jovenel Moise’s visit to Port-de-Paix helped mitigate the public anger borne from years spent living in extreme poverty without any real signs of improvement. Haiti is the poorest country in the Americas. But residents were still angry. “Everyone can see that we don’t have a real hospital,” one resident, Francois Lubensron, told AFP near the hospital entrance. “This shows we have no government. The president came to the city but he didn’t even stop by to see what is going on here,” the 28-year-old added. As they listened to the passionate debates of the small group gathered around Lubensron, elderly residents shook their heads.